My father bought a Sandpiper 19 a long, long time ago. We learned to sail as a family on Lake Erie. I fell in love with it all. And, one day, I proposed to my wife on that boat. Great memories. Yes, I’ve had plenty of disasters, failures and simple problems in my sailing career! The key lesson is that you are never done learning. I still consider myself a student. I work at getting a little bit better every time I go out. Feel the wind, feel the boat, listen to everything, look around you, live in the moment. Don’t buy too much boat too soon. I’m a cruiser and appreciate the creature comforts big boats give you, but you need to master your craft first. Be patient, gain experience, and move up in increments. My father, followed by Bernard Moitessier, Sir Robin Knox-Johnston, Ted Turner, and a fellow instructor and the former owner of Narragansett Sailing School, Rob Lawnsby. Walking, hiking, travel, music, food, family, friends… It’s good to be alive! 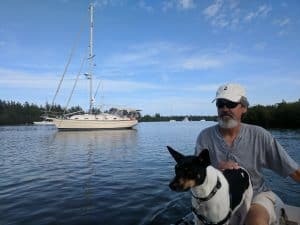 Dave owns an Island Packet 35, and enjoys sailing around the bay and beyond. Dave is one of those rare instructors that can let a student flounder while learning a new skill, and gently guide them to the correct path before they get frustrated. Very experienced, a gentle soul, and with a crisp mind to zero in on what easy prodding will give the student the most confidence.